I stitched this table runner for my kitchen table. In a break from my normal routine, I employed a bit of self-discipline and applied the binding immediately. I think it will look great on my table…now it’s off to the garden center for some flowers to match! Fabulous colour and I love the way you have quilted between the flowers! I tried following your tutorial yesterday just drawing it out. I am finding it really difficult to just draw but will persevere. Thanks for sharing the result – it makes me even more determined to continue practising. I am so glad you are sticking to it! Drawing it on paper is very important! Once you can draw it on paper, you will be able to stitch it on fabric! Please let me know if I can ever answer any questions! Oh WOW! What beautiful work! Thank you! I think everyone is in search of a little color right now! That is wonderful! 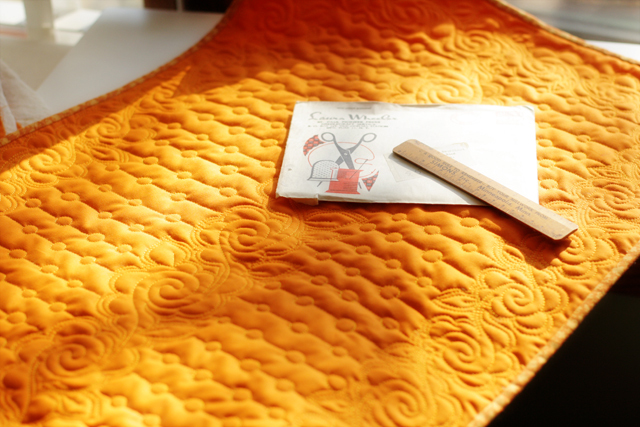 Isn’t it nice to work with some fabulous orange once in a while? Orange reminds me of summer—and we’re expecting an April blizzard here in Minnesota! I’m a new follower. 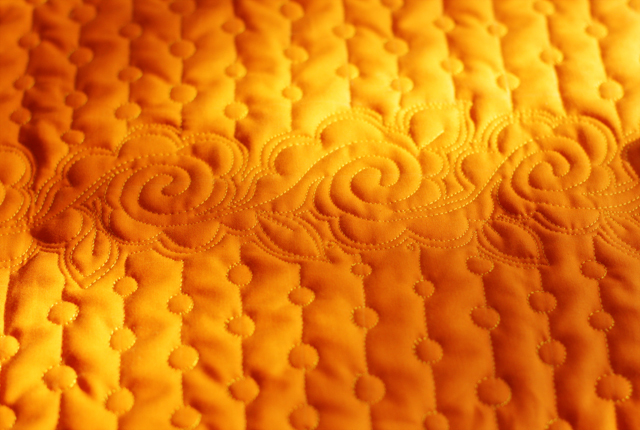 I love the sewing machine quilted design on the sidebar. Very cool! This is really gorgeous! 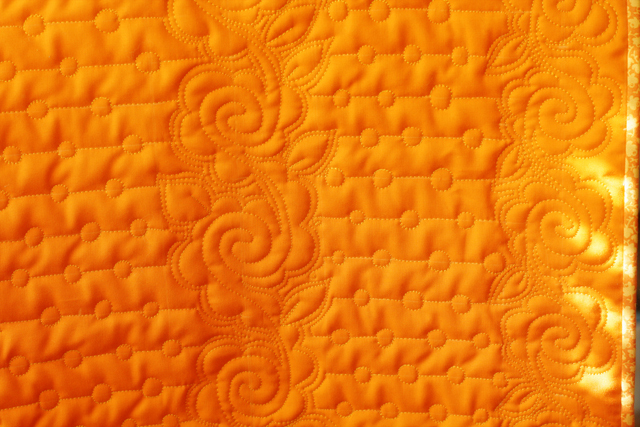 I can see that I need to start quilting on solids–it really makes the designs pop. Thanks for sharing your talent. Amazing! You are very talented and I very much appreciate the step by step you posted yesterday! This is really gorgeous! 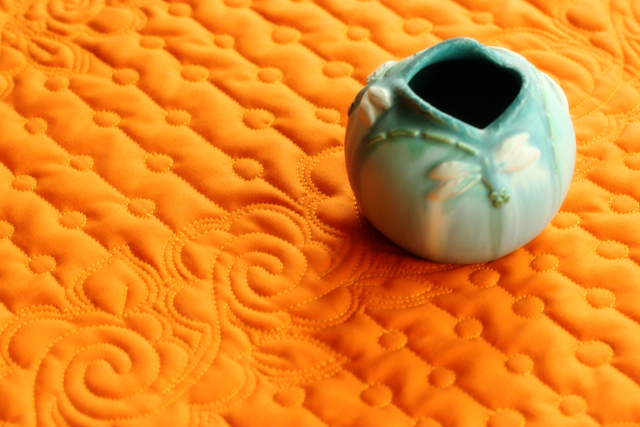 Love, love, love the FMQ flower. Thanks for sharing. I plan on using it on a quilt top my grandmother made (in the 1940’s), that I’ll finish using this motif! I hope to write a book…still some details to work out. Love that color, reminds me of mac an’ cheese. Oh, and I like your new banner. Love that color too. You must be hungry! I’m glad you like the new banner! How cheery! 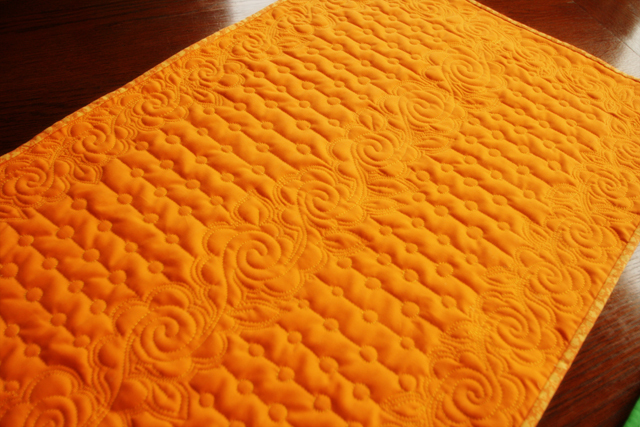 And nice quilting!